Dominican Liturgy Publications is happy to announce the publication of the Ordo for The Dominican Rite in 2017, which is the work of the editor of Breviarium S.O.P. This booklet is intended for use by anyone who prays the 1962 Dominican Rite Breviary. 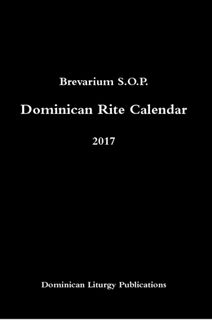 It includes a complete calendar for the Dominican Rite liturgical year for 2017. In addition, it includes the collects for the Dominican blesseds who are not on the calendar (so that a votive commemoration can be made of their feast), obits of the deceased masters of the Order, and announcements of days when Lay Dominicans can obtain plenary indulgences. Finally, it contains an English translation of the Office of Prime, which was omitted from the 1967 English translation of the Dominican Breviary.